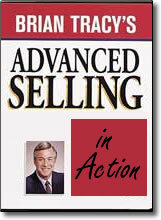 Advanced Selling in Action DVD by Brian Tracy – Discount! If you’re interested in maintaining and building upon a successful sales career, Brian Tracy’s Advanced Selling In Action is the program you can’t be without. Each of the four sessions focuses on an advanced sales topic that, once mastered, gives you an advantage with any customer or competition you might face. Here is an invaluable source of cutting-edge information designed to boost your career into the upper echelon. This segment is the ultimate lesson in the power of walking your talk. When you can stand tall and feel good about what you’re doing, your sales will soar. From prospecting to follow-through, in this segment you’ll learn how building a relationship boosts your sales advantage. This segment is the video guide you need to make sure you are the supplier with whom your customer feels most secure. This video segment shows you why persistence – and other key characteristics – can pay off for you in a big way.